In her fictional book, Restless in L.A., author Robin Finn tells the story of Alexandra Hoffman who is a stay-at-home mother to three children and one of them has ADHD. The book chronicles how she tries to live up to the high expectations of each role of wife and mother, while being desperately lost in recognizing her own sense of self. The societal pressure in Los Angeles to be the “perfect mother” is especially high with all of the mom judgers. Sometimes a mom’s sense of self or the person who she was before marriage and kids becomes a distant memory. Alexandra often reminisces about her youth when she was more care-free. In the enthralling book Restless in L.A., the main character, Alexandra, decides to look up an old flame on social media. What was supposed to be an innocent catching-up ends up being a steamy and captivating tale which leads to a lot of trouble! 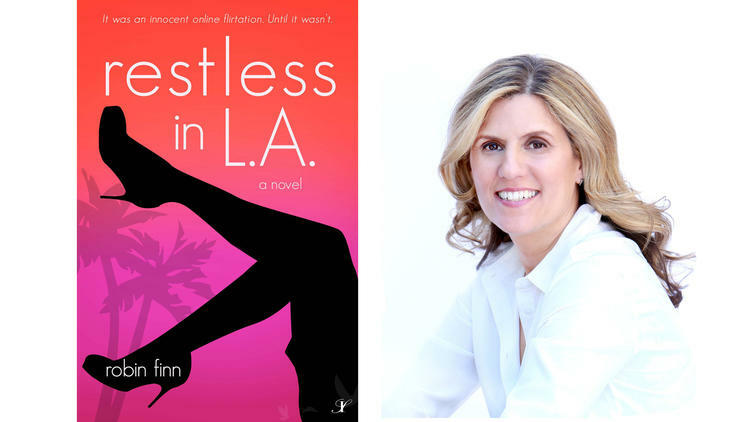 Restless in L.A. is the first novel by Robin Finn. Robin isn’t just a writer. She is also a coach to other writers by assisting them to move forward in their writing projects. She also works with women on #mombition. This is finding out what you want to do with your life separate from your family and children. Moms in particular can get caught up in a nurturing cycle and forget to care of themselves. Robin believes that we are all born to be creative individuals in one way or another and we are happiest when we reserve some space for that outside of caring for our families. When it comes to work, Robin has two favorite things. The first without out a doubt is when she hits “the flow.” This is when the words just come to her and are flying out of her fingertips onto her laptop! She calls it the “divine download” and says that when she is in that space it’s simply the best! The second thing is she loves working with others one-on-one and in workshops. It thrills her to see those she works with move forward with confidence and their willingness to go for what they want! I asked her what she personally finds challenging about balancing family life and business. She said she gave up on balance a long time ago. She oscillates, meaning swings back and forth, and wavering between extremes in action. When she has a deadline or is just in “the flow” she writes like a mad woman. Then one of her kids needs a parent teacher conference or the backyard floods or her mom isn’t feeling well…BOOM! She is not just a writer. Instead, she is a Mommy, Wife, Daughter and Advocate all wrapped into one. Then, everything settles down for a moment and she is off writing, pitching, and doing workshops…then BOOM, kid with an asthma attack! She doesn’t try to balance. She just goes with the rhythm of her life! When I asked her what inspired her to start writing, I fell in love with her response. She said that she was born to be a writer, but forgot for about 30 years. She started writing again at the age of 40. After a 2 year program, she studied Spiritual Psychology. She learned so much through that program, but the key take-away was that she learned she was a writer that did not write and not honoring that truth was making her miserable. Formerly, Robin has worked in public health, public relations, and health communications. After getting all of that under her belt, she stayed home raising her 3 children (2 daughters 12 and 17, and her 14 year old son) while freelancing on the side. When I interviewed Robin, I asked her what her day was like today. She had stayed home in her white fuzzy robe with her son. Both of them had colds. They watched an episode of Shark Tank (one of my personal favorite shows). She sent an invoice to Buzz Feed for an article she wrote called ,“17 Refreshingly Honest Realities Of Raising A Kid With ADHD”, made an appointment to have her washing machine fixed, pitched an article to the L.A. Times about Spiritual Parenting and took her 5th rejection from the parenting editor at the New York Times (but this fiercely driven woman is not giving up)! Robin is like the rest of us parents with a child home sick and a to-do list a mile long! Robin loves to hike, travel with her family and truly enjoys nature. A good hike on a great day with any or all of her kids and their family dog is perfect. As far as traveling goes, her favorite trip was Costa Rica. This past summer, her family enjoyed swimming, biking and hiking at a cabin at June Lake. I have to say that by having seen Robin speak, meeting her and interviewing her, she has given me a much better perspective on my own life! www.robinfinn.com or on Amazon at: http://a.co/5gGXtEJ.